…your Boots till spits I mean! If you spend over £5 you get a voucher. 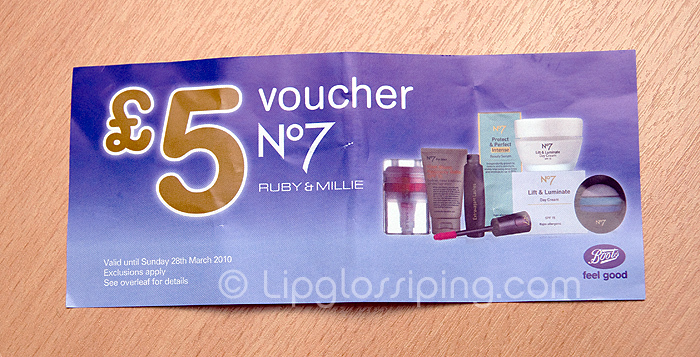 The voucher entitles the holder to £5 off Boots No7 or Ruby & Millie (a British cosmetic brand). That’s it… no catches, nothing. How lucky are we? Boots No7 Eyeshadow Blend and Contour. I have a few of these (ok, about 6) that I grab from my brush pot when I’m too lazy to go and wash my ‘good’ blending brushes but obviously don’t want to muddy my eye look. They’re not the softest nor the most well constructed, but for £1.50, they’re pretty darn decent backups! 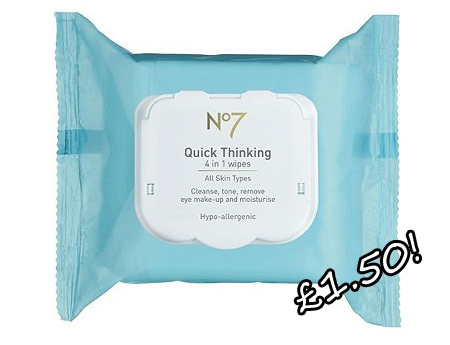 Boots No7 Quick Thinking 4 in 1 Wipes. Love these wipes, they really do a stand up job at removing makeup. I mostly use them to clean off swatched hands or if I’m playing with my makeup. I prefer a proper face wash before bed! These are great for travel too, but I wouldn’t pay the full price. Boots No7 Ultimate File and Buffer. You can’t get a better bargain than free! I have one of these in the glove box incase of an emergency broken nail. Don’t laugh at me, you’re not even a proper GIRL unless you have an emergency nail file set. Go redeem yourself down at Boots immediately! Boots No7 Eye Colour Brush. I haven’t tried this one, but I used to pick up ones from the No7 range which looked simillar (except they had black bristles) and I swear by them for depositing a healthy amount of colour on my lids. Unfortunately, they’ve been discontinued and I’m wondering if these are the replacement? Anyone know the old ones I mean? They used to come in little black cardboard boxes (usually found on the bottom shelf of the No7 stand), I think they were £5.75 each (before voucher redemption) so they worked out at 75p each after, total bargain! Anyone tried these white bristled ones? Ruby & Millie I-Liner Brush. I haven’t been hugely impressed with much from the Ruby & Millie range and some of the brushes are (imho) pretty awful. This one however, I like. It’s great for pushing gel and cream liners right into the lashline slightly under the lashes. Don’t try and line above the top lashes with it though… well, not unless you’re incredibly nifty with an eyeliner brush. 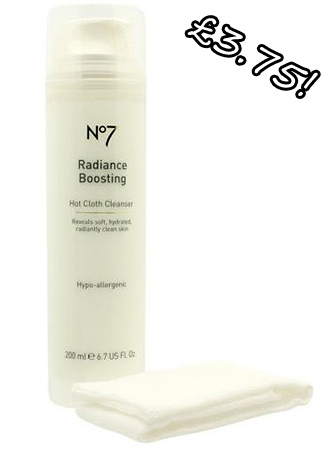 Boots No7 Radiance Boosting Hot Cloth Cleanser. £3.75 for a Hot Cloth Cleanser and muslin cloth is a total bargain I reckon! I’m currently trialling the original Liz Earle version (review coming soon) and I’ll be picking one of these up in the next few days for a bargainous comparison. It’s worth noting too that this No7 version has clocked up no less than twenty 5 star reviews on the Boots website. Having said that, if it’s anything like the Boots Time Delay Cleansing Balm (Eve Lom ‘replica’) then it’ll leave me in tears. Literally. So, that’s my ‘picks’ for your £5 “till spit”. What do you rush to stock up on everytime the offer rolls around? Don’t keep your bargains to yourselves, did your Mama never tell you it’s good to share? I love you even more now than I did before for posting this. I have seven of the vouchers to use and didn’t know what to use them on, I have the brushes you mentioned but I’m loving the rest of the stuff you posted up. I’m using mine up today so I’ll be home with some good freebies later. I usually spend mine on any of the No7 brushes, but this time I think I’ll go for the Hot Cloth Cleanser. I use the Liz Earle one (which I won in a competition!) and I like it, but I don’t like the price at all, so I’ll also buy this as a comparison. I just hope the little Boots that I go to has it! i have a zillion of those brushes! i can’t say that i wear eyeshadow very often, but those brushes will certainly do! I usually end up getting stay perfect eyeshadows or eye pencils/ eyebrow pencils with them. I think No7 is really bad value for money though at its full price- if I had Ruby&Millie cosmetics in a boots near me I would be hammering that counter instead! I’ve always been told by the assistants that you can’t use them on R&M brushes or tools though? I use mine for No7 blushers, lip liners and backup eye brushes! I have the ‘colour’ brush you mentioned, in comparison to the MAC 239 it’s more synthetic/silky feeling, is much flatter and more pointed at the end and doesn’t pick up much colour, which is why it’s a backup! I use mine for the No7 blending brush and have quite a few of them now. I like the R&M angled eyeliner brush too. The No7 cotton gloves are a bargain at £1 (after the voucher) and are great for wearing over handcream. 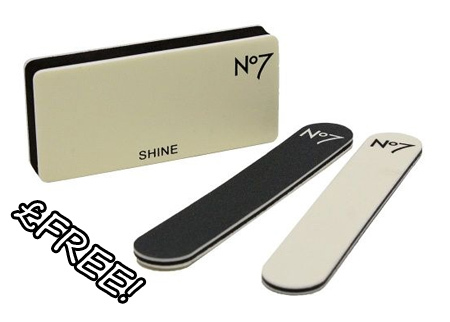 The No7 eye colour brush is great for cream shadows and concealer and is worth having. If your Boots has self-serve checkouts keep an eye out for the pile of till printed vouchers that build up behind the carrier bags……but don’t tell anyone I told you! I got one the other day, and picked up a No7 nail polish in totally teal, and it is sooo pretty! I rarely shop in Boots. My local shop isn’t very big. I buy most of my beauty stuff online. Boring stuff (cotton wool etc) comes from the supermarket. I have used the same lipbrush for a million years but have lost my foundation brush. How did that happen…..
Oh dear what have you done?….. I have never used one of those vouchers even though I must have accumulated tons over the years (you have totally made sense of the whole concept now, why didn’t I “get” it before)…..my shoes are going on and I am out the door. it was only this time that I actually thought to have a good look and make some purchases. I accumulated 4 or 5 vouchers, and today hot footed it down to Boots during my lunch. I got a pack of 3 No 7 Muslin Cloths for 50p!!! and a really great No 7 headband for £1. I also got a really nice pink blusher candy something. Only two days more to use them!!! i do miss good ol’ Boots!! The drugstores will never replace it; i used to spend hours in there when i was young (i guess the addiction began when i was young) it holds a special place in my heart! You’re so lucky! I have one of the old black No.7 brushes that you talk about and I love it! Ive got another voucher to use, so might get the white haired one… see if its a match. I usually buy the No7 Eye makeup remover but recently I have bought a couple of the No7 brushes (love the concealer brush). I also bought the Ruby & Millie foundation brush. I have a few of them in my bag, but I don’t use No 7 much, other than the limited edition pretty powders and eyeshadows, so haven’t spent them on anything this time. Probably won’t now, there’s nothing I really want at the moment. Gah.. Whenever I’m in England, which is quite often, they never do any good offers like that! And now I’ll miss this one by two days haha. I work in a Boots store and I have to say I’m rather glad to be done with giving out those vouchers for a while! I bought the Shine Free Makeup Base. With the voucher and my discount it cost just over 2 pounds! I’ve got one more to use and I think I’m going to use it on one of their bright pink lip glosses. These vouchers always come in handy. I have yet to find anything on the Ruby and Millie brand except their lipgooss thing that you twist up for the colour. I bought Iced Mocha nail polish by No7 with one of my vouchers, which I keep forgetting to blog about. I usually buy the face wipes but have been buying my face wipes from avon and anywhere thats sells a reasonable one. I have one voucher left. I do not really like the ladies on the No7 counter they can come across as very cold. Fashion Fair, Mac and Benefit counters are always more welcoming.